You are currently browsing the BestOfBothWorldsAZ.com blog archives for the day Wednesday, September 26th, 2018. It is not enough to know that the risks of treatment exist, but to understand why they exist, so that you know what precautions can be taken to reduce the risk of a complication. How Safe are IPL and Cosmetic Laser Treatments? Laser and Intense Pulsed Light (IPL) devices have been used in the medical community for over 25 years, and the amount of treatments performed has increased exponentially since then. According to the” American Society of Plastic Surgeons”, over a million Laser Hair removal treatments were performed in 2017 alone, which is up 48% from 2000. Laser Resurfacing (including fractional laser) is up 244% from 2000. According to a study published in the “Journal of Clinical and Aesthetics and Dermatology” the existing evidence base of over 25 years of use, to date has not raised any concerns over the long term safety. 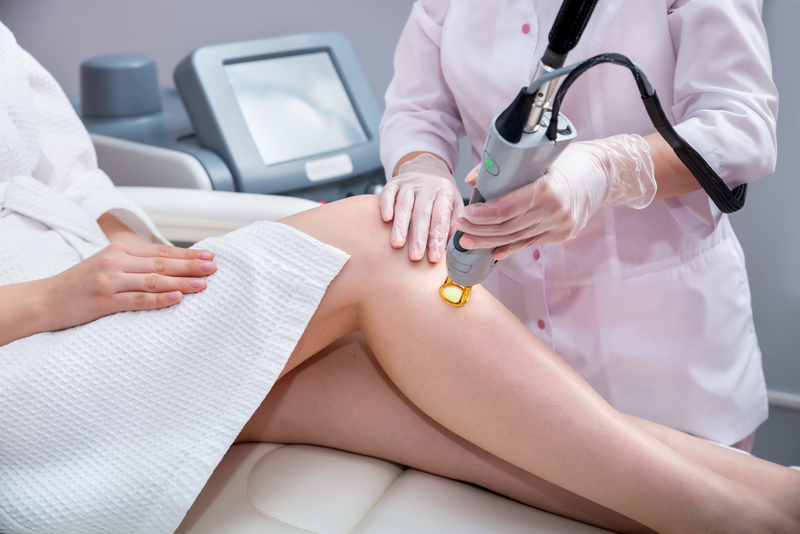 With millions of laser and IPL treatments successfully performed each year, these treatments are considered generally safe, however all of these treatments come with inherent risks. The risks associated with laser and IPL treatments include lack of results, burns, blisters, infection, hyper-pigmentation, hypo-pigmentation and in severe cases scars. Prior to treatment patients sign an informed consent, not only consenting to treatment, but also that the understand and except the risks associated with treatment. Laser and IPL devices work on the principle of photothermolysis or selective absorption. There are a variety of wavelengths and each wavelength targets a specific chromophore, such as water, hemoglobin/blood or melanin. The laser used in treatment will depend on what your intended target is. For example, if you want hair removal or to address brown spots, a laser with a wavelength that is well absorbed by the melanin (color) is used. The goal is for the ratio of absorption in the intended target (in this case hair or a brown spot) to have greater value than the that of the surrounding skin. To put it more simply, we want the skin to be lighter than the hair or brown spot. The more contrast between the color of the brown spot or hair, compared to the color of surrounding skin, the more effective the treatment. It also makes the treatment safer, because the heat is confined to the targeted lesion, without damaging surrounding tissue. If someone is tan or has had unprotected sun exposure, the melanin levels in skin increase, so now instead of just the intended target absorbing the laser energy, the surrounding tissue will also absorb the energy. This is why tan skin is prone to a burn. The same concern applies to darker skin types. A majority of cases occur due to incorrect parameters being selected, based on patients skin color or ethnicity. This explains in part, why there are more burn complications resulting from IPL and Laser Hair Removal treatments compared to laser resurfacing. There is also a misconception that these treatments are less aggressive and some how easier to perform. In fact, it could be argued that IPL is among the most technique dependent treatments. Part of what makes IPL devices so popular is it’s many applications. (I’m about to get technical again, only to demonstrate my point) IPL has such great versatility because, unlike lasers which only use a single wavelength, it uses a broad band of wavelengths. In each treatment, a provider must select an appropriate “cut-off” filter, based on which wavelengths you want to filter out. In addition to choosing the appropriate filter, the provider must select the energy used, pulse duration and with some of the more advanced devices the provider can select the number of pulses in each shot along with the delay time between these pulses. All of these parameters can allow an experience laser technician to provide a safer and more effective treatment, however there is also more chances for error. Another risk factor that is rarely discussed, is the reliability of the equipment. As these aesthetic laser treatments have become more popular, so has the demand to produce them. It should not be assumed that just because a device is new, that it is better. Often, when a device or technology has been used with success, we will see other versions being produced by competitors, which may be cheeper, less effective and possibly less safe. Not all devices are created equal, I often use the comparison of a smart phone vs a flip phone. Both are phones, both can perform basic tasks such as texting or making a phone call, but we understand that a smart phone has many other uses and is technically superior. Uncertified refurbished devises or devices that have been purchased second hand may have defects that cause serious complications. An even bigger concern is knock-off and counterfeit devices. In 2014 there was an article published in the journal “Laser in Surgery and Medicine” warning of counterfeit devices. They found that the problem was more prevalent than most physicians and consumers imagined. The article pointed to 29 knock-off versions of CoolSculpting and at least five counterfeit versions of Ultherapy. Many of these counterfeit devices are produced in China and South Korea, and look remarkably similar to the real thing. These counterfeit devices are unregulated and not approved by the FDA, they are also illegal to purchase, however they are purchased from distributers and online. These counterfeit devices do not have the safety mechanisms required, and have resulted in many reported cases of injury. Does the laser technician have the proper certification and training? Regulations vary by state. As of August 2018, Arizona certifications will be renewed with the Arizona Department of Health Services (Bureau of Radiation Control). In Arizona a Certified Cosmetic Laser Technician must also be specifically certified for each laser application they provide. The approved applications are clearly listed on the certificate which must be posted. A certification only guarantees that the technician has met the minimal requirements to obtain a certification, so ask about their level of experience and any additional education they may have received. Good questions would include, how long have they been a laser tech, how long have they worked at that specific clinic, how long have they been providing the specific treatment your interested in. The clinic must also be licensed and have all the laser devices registered with the appropriate regulating agencies. The certificates must be posted and it will include a list the devices that clinic has registered. Who and Where is the Medical Director? Alway ask who the Medical Director is, and if they are on site. Many med spas hire a medical director who is never or almost never on site. You want to know, that if you need medical attention or a prescription ( such as burn ointment),that they will be available. In my experience, there is more accountability when it is an actual medical practice with direct supervision from a doctor. The best way to determine if the device is authentic, is to go to the manufacture website and use the provider search. Most Laser manufactures will have a place on their website where you can enter a zip code and it will list approved providers in that area. You can also ask if they purchased it new, directly from manufacture and if they regularly service their device. The most advanced lasers are obscenely expensive to purchase and maintain.Technicians that are highly qualified and experienced demand higher wages. All of the cost of providing the service is reflective in the price of treatment. Disclose medical conditions, medications, supplements and topical products used. Don’t just skip through your patient intake forms, those questions are there for a reason. Some medications and supplements increase photosensitivity and many medical conditions can inhibit healing. Always let your provider know if you are on accutane, antibiotics, pregnant or trying to become pregnant. Also inform your provider of topical products you use, such as retinoids, acne products and skin cancer treating drugs. Discuss any changes prior to each treatment. This is the big one! Your provider must know exactly how much sun exposure you have had, prior to EVERY treatment. Do not make any assumptions about, what counts. Everything counts! Tell them which sunscreen you use, and it’s even better if you bring it with you. Tell your provider your typical dosage, how much you apply to an area and how frequently. Also discus your ethnicity. Some people have lighter skin, but their ethnicity may make them more susceptible to a complication. Be sure that you clearly understand the risks involved and how likely they are to occur. This is the time your provider should let you know what things you can do to reduce the potential of having a negative reaction. This may include, preconditioning skin prior to treatment, avoiding unprotected sun exposure, avoiding heat post treatment, waiting until you have finished a certain medication. Don’t underestimate the value of taking a comprehensive approach to address your concerns. The treatment you seek out, may not be the most appropriate treatment to start with. Do not wait and see if you will a problem to find out if your provider would be able to address it. Some side effects or complications, such as swelling and bruising will simply require time to resolve. There are things that can reduce the duration of a bruise or swelling, however it is not required. Other complications, like an infection, a burn or hyper pigmentation need to be addressed quickly. If a provider does not already have a plan for addressing a complication, it would be wise to get a second opinion before having a treatment. It should also be noted that products, medications and additional treatment needed to treat a complication are not included with the cost of treatment and would be an additional cost to the patient. Do not assume you will get your money back if you are not satisfied or have a complication. You are paying for services rendered and you are consenting to the treatment knowing and excepting the risks involved.